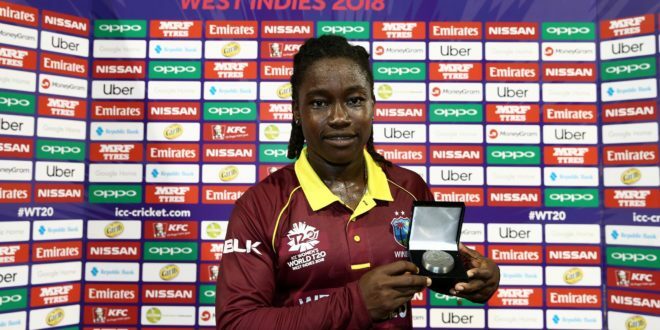 West Indies player Deandra Dottin is seen posing with the player of the match award during the ICC Women’s World T20 2018 match between West Indies and Bangladesh at Guyana National Stadium on November 9th, 2018 in Providence, Guyana. Dottin was responsible for taking Bangladesh out on 46 runs (the lowest score in the tournament’s history). The seamer made a tournament record when she took 5 wickets for 5 runs in 3.4 overs.